A local family owned neighborhood restaurant serving Italian cuisine for just under a decade. 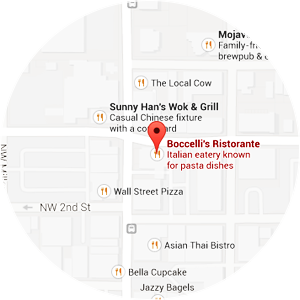 At Boccelli's we strive to make your dining experience a memorable one. We have a great knowledgeable staff who take pride in what they do and want you to be absolutely satisfied with your meal and your experience when you step out of our doors. We specialize in Italian cuisine and have over 25 pasta dishes to choose from and many other non pasta options as well. All of our dishes are made to order and are prepared with fresh local ingredients, everything from the sauces to the soups are made daily in our kitchen. We have an extensive wine list with local selections as well as a variety of wines from around the world. We are open for lunch and dinner. We also have a takeout option if you’re on the run.